Finding inspiration for handmade Christmas cards. It's not always easy to come up with designs for handmade Christmas cards. Sometimes if I'm really in a crafty mood, I can draft several designs at the same time. Other times, it's hard to find the creativity within that's needed to produce just one. I'm not sure if it was the warm cup of tea I was sipping on in front of the Christmas tree after my children decorated it, or if it was red and green glittered Christmas ornaments hanging from the evergreen branches. Something struck me at that moment, and I decided this year's Christmas card would be designed around a Christmas ornament. First, figure out the supplies you'll need for your design. I'm always finding myself doing retakes. At first, I pick out several options which I think seem like a good idea for my card design. Ultimately, I usually end up making the card out of totally different supplies. It's always a good idea to start with a clean work surface. As you pick out supplies that you think you might use in your project, place them in neat piles around the area, leaving a free spot to start your work. How to prepare for the project. Patterned cardstock size 12" x 12". Cut in half to 6". Fold. Set aside. Solid color cardstock size 8 1/2" x 11". Trim to fit the die cuts or circle size you will be cutting out. Purchase or make by hand. Cut out small sections for adhering to the top of the ornament. 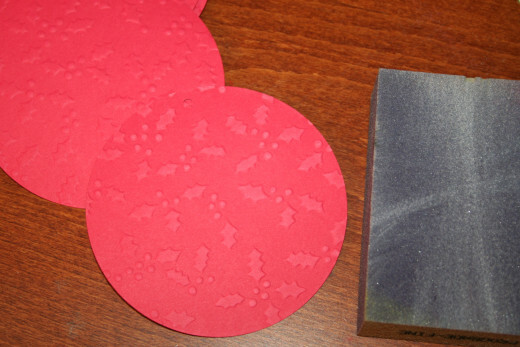 Glue dots and double-sided tape. Die cut machines or shapes cut by hand. Finished cards will be 6" x 6". Use a clean soup can (or coffee mug) for cutting out smaller circles. Draw around the can and then cut out. Use a paper plate to draw large circles. Place paper plate upside down, trace around, and cut out. Cut out shapes or die cuts first. If your project requires shapes or die cuts that need to be cut out, do those first. That will save time when assembling the project later. 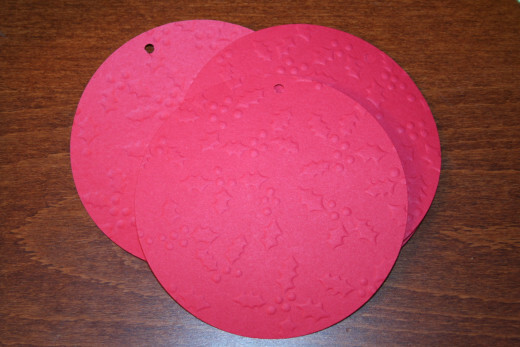 To make a round Christmas tree ornament shape, I chose a circle Sizzix die cut. There are machines that cut just circles, or you can cut a circle by hand as well. 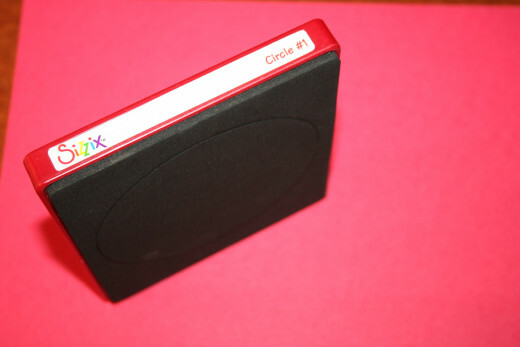 For this project, I used a medium sized circle die cut called Sizzix Circle #1. 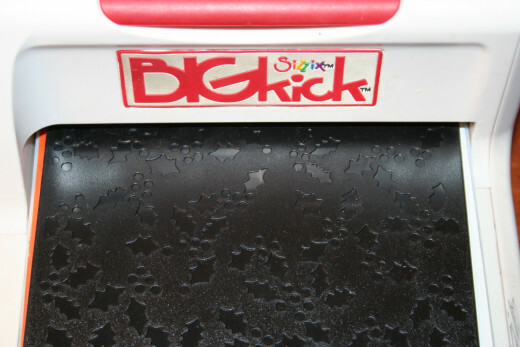 This die cut is used with Sizzix BigKick. 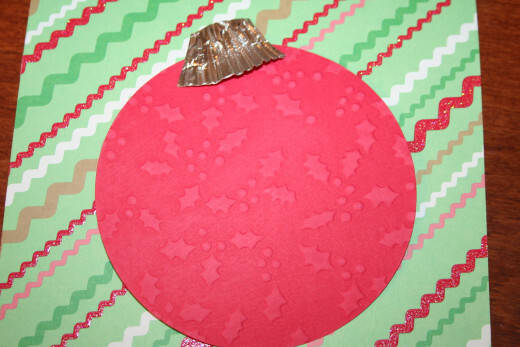 How to cut out a circle using Sizzix die cuts. Choose your cardstock. For this project, I chose a red piece of cardstock in size 8 1/2" x 11". 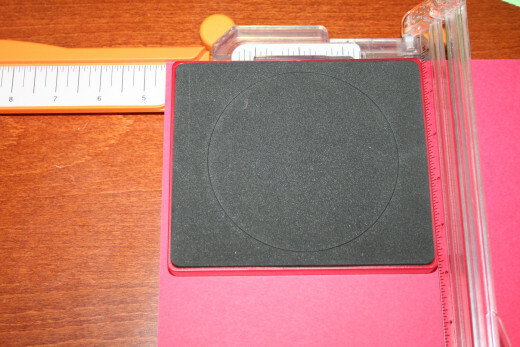 Measure the die cut to determine where to trim the cardstock. 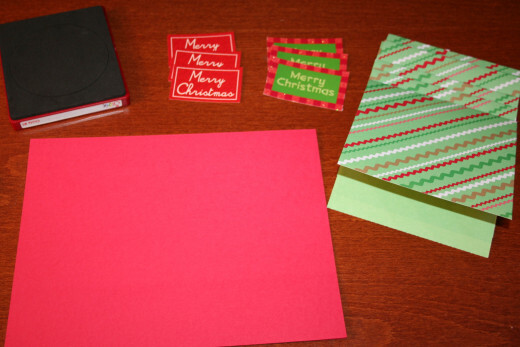 In this example, trim the cardstock to 4 1/2". 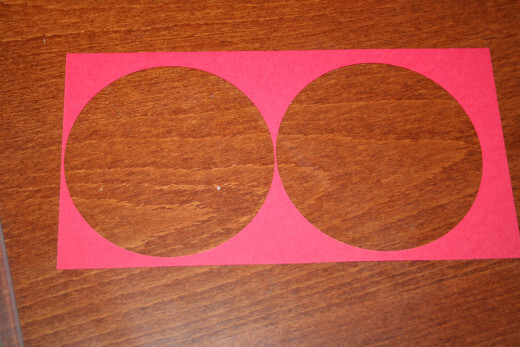 You can cut two circles if you place the die cut carefully on the cardstock. Cut out as many circles as you need. 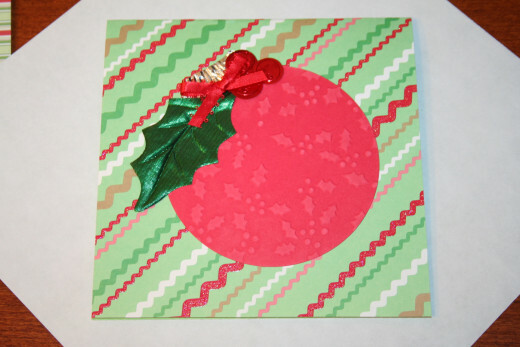 I made six greeting cards for this tutorial, so I needed to cut out six circles. I got four circles out of one piece of cardstock. 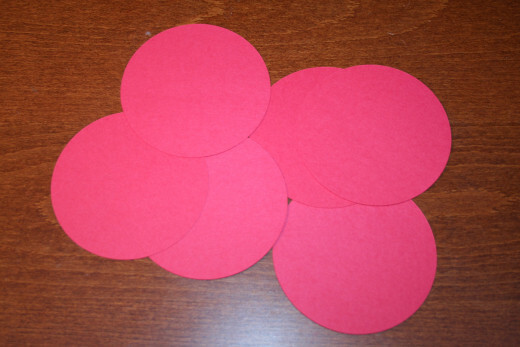 For this project, I used two red pieces of cardstock for the circles. Cutting circles with a machine. There is no limit to your imagination. 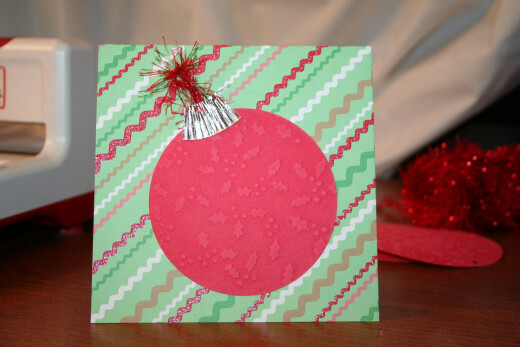 Use ribbon, glitter, rubber stamps and other supplies to add texture and design to your circle. In digging through my scrap stash, I found pre-made holly leaves and berries. That saved a lot of time from cutting them out individually. 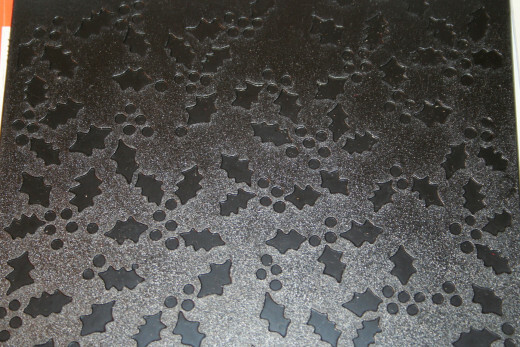 I decided to go ahead and emboss the circle with the same holly berry pattern. Adding finishing touches to the design. Play around with your supplies until you are happy with the results. Here, I chose to use pre-made holly leaves and berries. A little adhesive goes a long way on embellishments. I angled them where I wanted them and I was happy with the result. I created the top of the ornament out of a mini paper baking cup. I cut out a small section and adhered it to the top of the card. 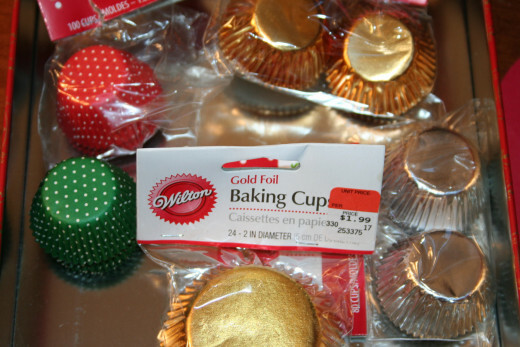 Paper baking cups come in all sizes, colors, shapes, designs, and foils. Keep a stash of products on hand for when you get the urge to create a card. 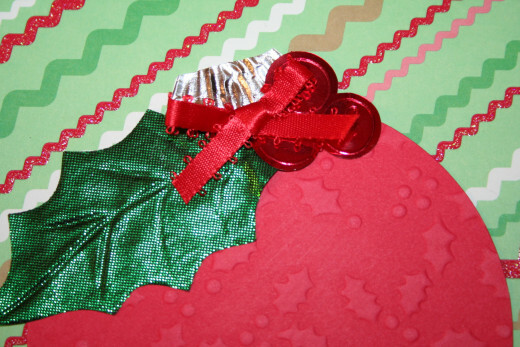 For this tutorial, I used pre-bought cardstock sentiments. There is no limit to what you can say inside a greeting card. You can even leave it blank. Wishing you blessings this holiday season and throughout the new year! May your home be filled with warmth and happiness during this holiday season. Good tidings to you at Christmas and the coming New Year! May you find joy and peace during this holiday season. 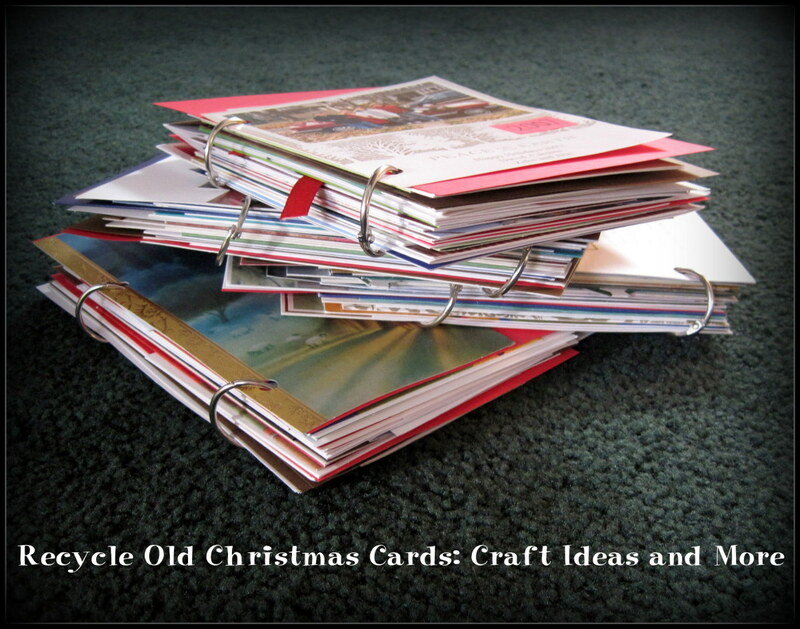 Make your own Christmas, Valentine's, Easter, Thanksgiving, and other holiday cards in large amounts all at once! Make individual or all the same. Illustrative guide to making cards. You can make as many or as little as you want. There's no set rule when it comes to making greeting cards. You can make one or a hundred. It doesn't really matter as long as it suits your needs. I made six matching greeting cards for this project because I had six of everything on hand already. I didn't have to purchase more supplies to make these. Normally, I would go to the store and pick out matching supplies for the project I wanted to create. I like browsing through a large selection of cardstock, both solid color and printed with patterns, to determine what creation I will make next. Some of my favorite stores include Michael's Craft Store, AC Moore, Hobby Lobby, and Joanne Fabrics. 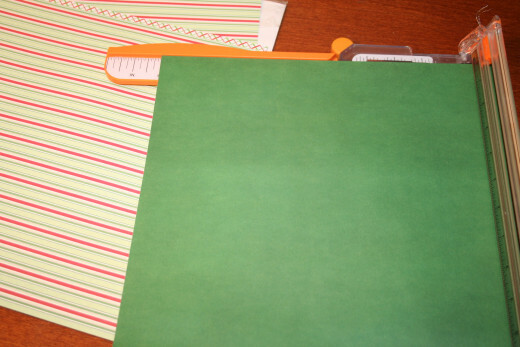 For the envelopes, trim a 12 x 12 paper to 10" on two sides. 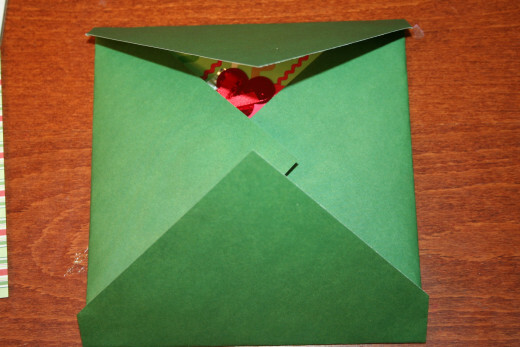 Set your card in the middle of the cut paper to fold the envelope. Adhere your envelope. The card is complete. How many attempts do you try at something before giving up? If I don't succeed the first time, I give up. I try until I can get it right. Although sometimes, it just doesn't work out. The main idea here is to create a design that you thought of through inspiration in your environment. For me, it was observing a Christmas tree when my mind was relaxed. However, sometimes it takes several tries to get a design on paper that I'm thinking of in my mind. 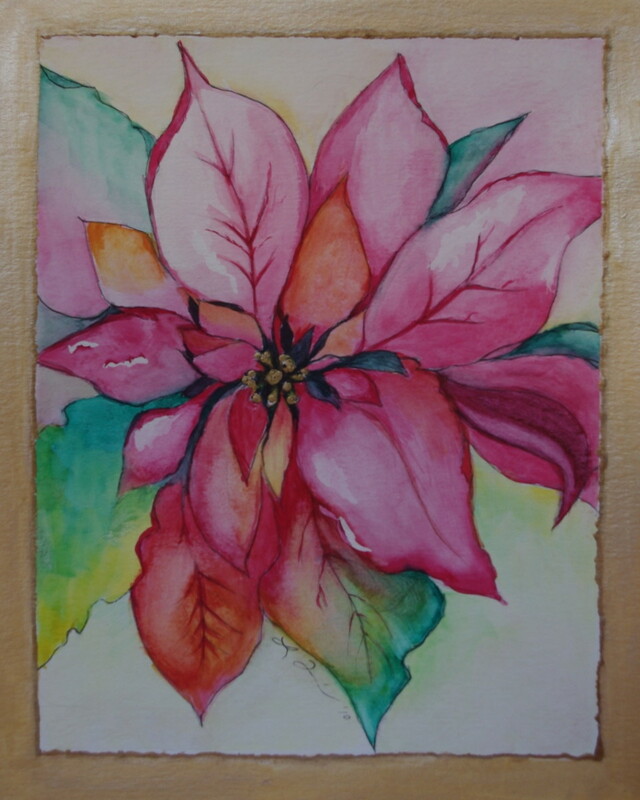 In fact, my first attempt at this card didn't look like a Christmas tree ornament at all. This looks more like a party popper than an ornament. Thanks for stopping by and reading this tutorial. I hope you find inspiration to create lovely handmade greeting cards to share with your friends and loved ones. Hello Linda! Thank you so much for your kind comments. What a good idea! The card turned out so professional looking too. Hello YourTutorials! Thanks so much for stopping by. Hi Pamela! It's so nice to see you. Thank you so much for your kind comments and voting. Hi Ocla! Thank you so much. Very kind of you. Very nice. Nominating this for Editor's Choice and voting up. Very practical ideas, money-saving too. Thank you very much for the clear instructions and helpful pictures. Happy Christmas to you and yours. Hi Peach! Sometimes when I don't have the supplies on hand, I just go to the store and buy pre-made embellishments and some scrapbook paper. Jolee's stickers make a really nice line of pre-made embellishments that add a lot of color and texture to cards also. Thanks so much for stopping by. Hi Alicia! Thanks so much for stopping by and commenting. I truly appreciate it. Hi Suzette! Thanks so much for your kind comments. Thank you so much Rebecca! It's nice to see you. i like yr simple design. Just that I don't have all the card making stuff. Hi Pamela. Thanks so much for stopping by and leaving such wonderful comments. I truly appreciate it. Hi Ocla20! Welcome. Thanks so much for your kind comments. It's nice to see you. Hi Maira! Thank you so much. This year I mailed out 5 cards. That's down from about 75 I used to make and mail. The postage is just to expensive now. It cost 66 cents to mail these. Hi Marcy! It's so nice to see you here. Thanks so much for commenting. Hi Sha! Thank you so much for your kind compliments. I was invited to teach a class at a school once. I went and bought supplies enough for 20 students which cost a small fortune. Then, I received a phone call that they decided to post pone the class. But the supplies were for Valentines, so I asked if they could at least have the class before Feb 14. They agreed. Then the day of the class, no one knew what room I was supposed to be in. It turned out it was a voluntary class and only 4 teenage girls showed up. That wasn't too much fun. They weren't interested in making cards at all. The only other time I have been asked to teach a class was by a woman who owned a scrapbook store. I brought in my portfolio and donated a military page to her for her weekly raffle. We live in a military town. She loved my work and asked me to teach for her on Friday nights. The problem was my children were infant/toddlers then and I could not leave them on a Friday night to teach the class. She closed up shop a few years ago. Hi Susan! Thank you so much for your comments! Hi WiccanSage! Thank you so much for your comments. That was another idea I thought of too. I was going to apply some ricrac on the ornament. But I stopped at the embossing part. Thank you so much for stopping by DDE! I truly appreciate your kind comments. 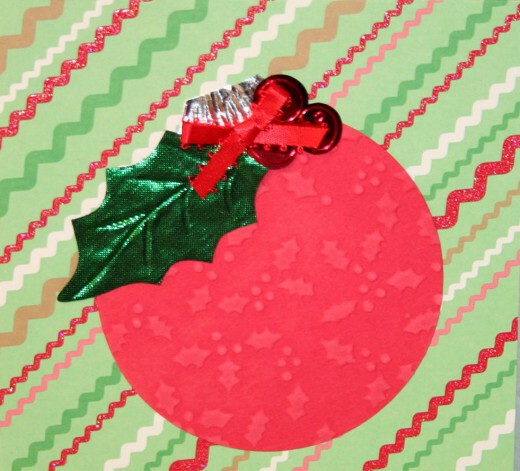 You have some lovely ideas for creating cards, Crafty! The results look so pretty and cheerful. Thanks for sharing the very useful instructions. Thank you so much Chitrangada! I truly appreciate your kind words. I haven't been writing much since my grandfather passed away. I could barely get this Hub done, so I really appreciate your compliments. Hi Lambservant. Thank you for your kind comments. Hi Flourish! Thank you so much for your comments. 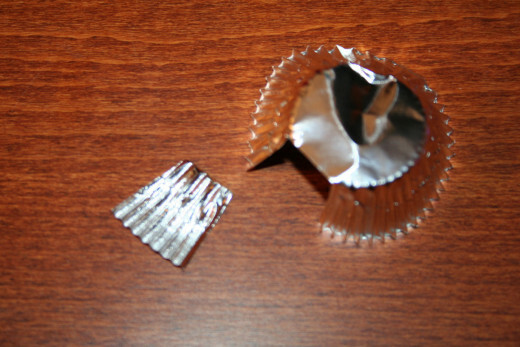 I'm glad you like the use of the cupcake papers. It was the only thing I could think of that looked like the top of an ornament without going through great effort to create something. Hi Jackie, you are too cute! Thank you so much for your comments. Hi Faith! LOL When I made the first card, I laughed so hard because I couldn't believe what it looked like. Thank you for commenting. Hi Kidscrafts! Thanks so much for your compliments. I truly appreciate it. Thank you so much for your kind comments Glimmer Twin Fan! Your Christmas cards are beautiful and creative. Your instructions are wonderful and easy to follow also. Thanks for sharing your knowledge with us. You are so good at be crafty. I love what you think was a failed design. It is great. Making cards and envelops for Christmas is such a meaningful thing to send to someone and yours are beautiful. I think you ideas are very clever. Voted up and shared. Amazing work! I like the creativity involved here. Plus it is much more personal than buying a random card at the store. Oh, so cool! I want to take lessons from you, or something! 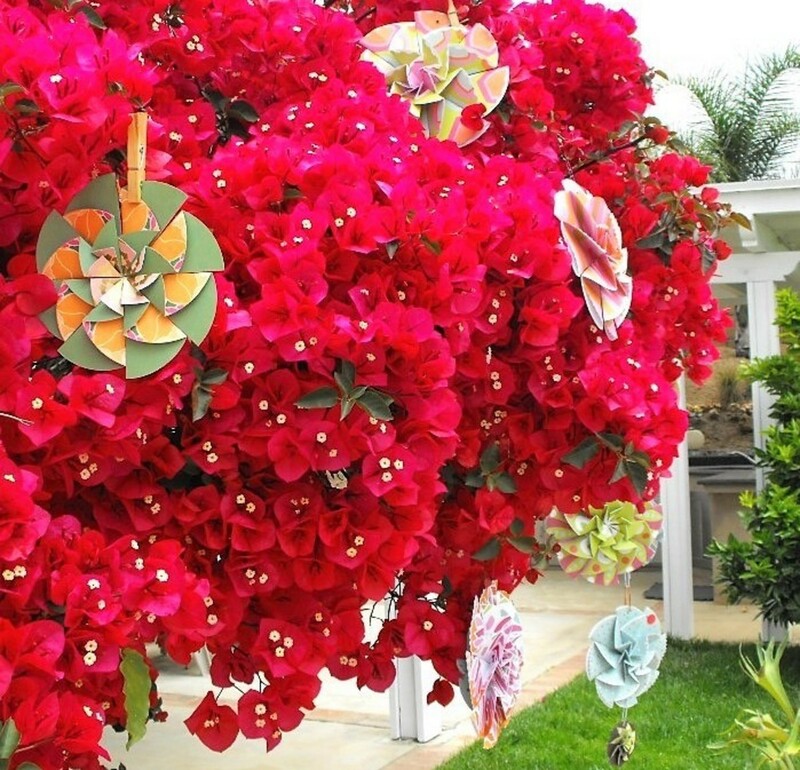 I love the idea of using ornaments as the inspiration for these. On my list for future projects! Crafty, I don't know where you find the time or muster up the patience for the amazing crafts you do. I am not crafty because I lack the patience. Your tutorials are very specific. Have you considered teaching an arts and crafts class? I really like this idea and you've made it look so easy to do. Will pin this so that I can try making my own cards next year. Beautiful! I love it, it's simple but so festive. I always love the look of ricrac & embossing. I already made my cards for this year but I'm keeping this in my paper crafting idea file. 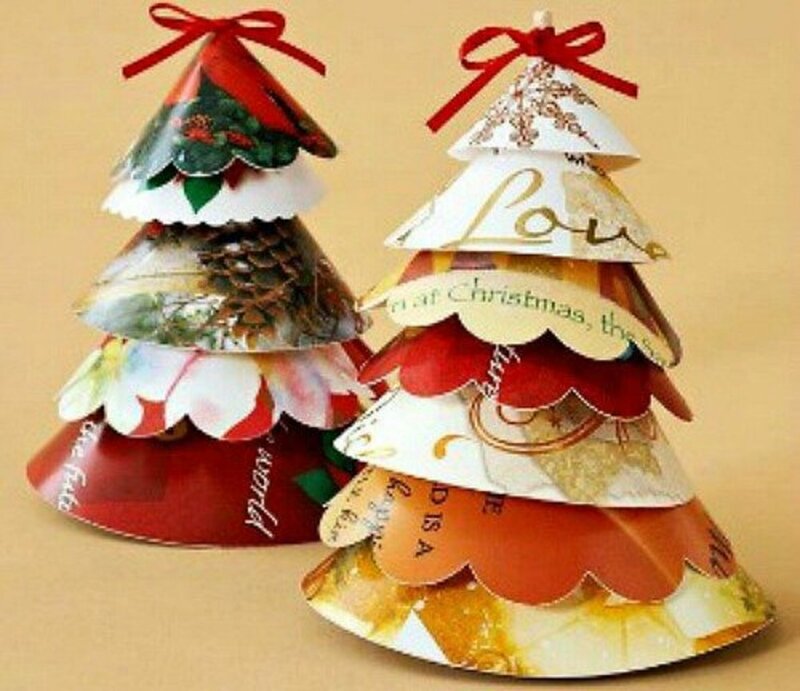 How to Design a Christmas Card using Tree Ornaments as Inspiration is an amazing idea for the Holidays. Beautifully approached with your creative mind you can do anything you want. I always enjoy reading and learning from your great hubs. Voted up, useful, interesting, awesome, and beautiful. Wonderful and very creative hub! I must say, you have put in lot of effort in this hub and it shows. With the help of your instructions and helpful pictures, I am definitely going to try to make these Cards for the New Year. Thanks for sharing. Voted up and pinned! Very cool. you are indeed crafty to the core. Very creative. 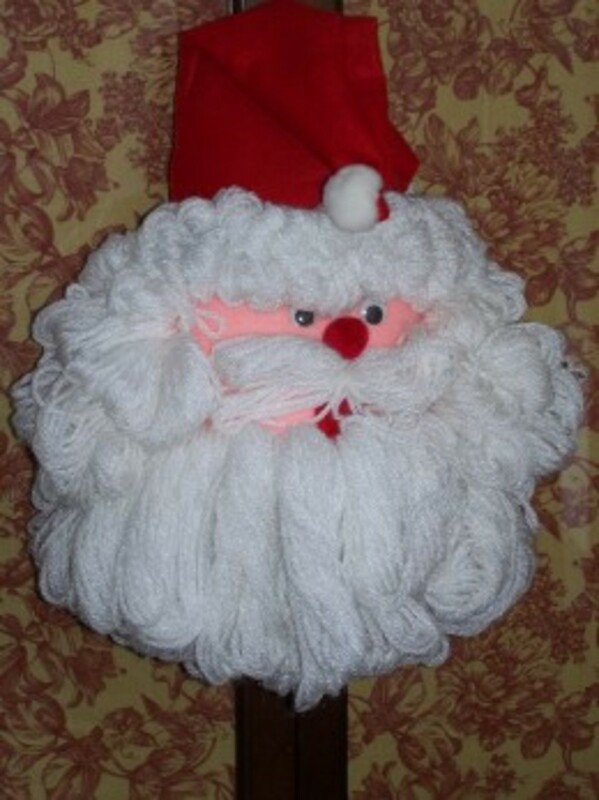 I think my favorite part was your use of the cupcake liner for the top part of the ornament. It captures the effect perfectly, and they do come in both gold and silver. This is really well done, Crafty. You create gorgeous cards, Crafty! Your explanations are very detailed and easy to follow.... as always! Great pictures as well! Have a great week and enjoy the time of the holidays! If I was still teaching I would be using this wonderful activity. Very creative and well-explained. This card is gorgeous! Love this craft and will have to try it if I get some time. Pinned for a reminder. 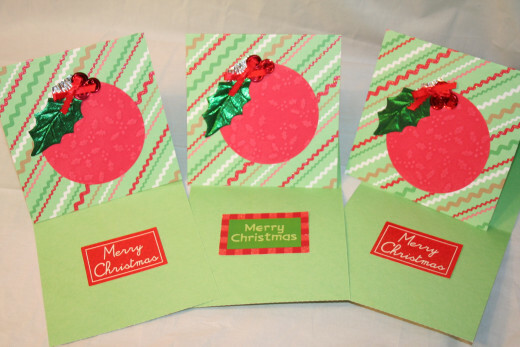 That's such a great idea Ann, to use pinking shears to make gift tags out of greeting cards. Every year I try to make my own gift tags. Then every year I end up buying them. LOL This year I had no time for anything. I barely got these cards done yesterday. Thank you so much for your comments! Great ideas for our own cards! I always think that home-made cards are so much more personal. People know that you've spent some thought and quite a bit of time to produce them on a personal level and that makes them feel special. I use one year's cards to make gift tags for the following year. I merely use pinking shears to give a decorative edge, having cut out relevant pictures of varied sizes from cards I've received. Then I can choose pictures for the children, like Santas or elves, and for the adults, like snowy village scenes or more religious ones. I haven't bought present tags for years!